Several days of raging wildfires across California burned an area nearly seven times the size of San Francisco, destroyed thousands of buildings and left dozens dead. Three major fires scorched more than 200,000 acres, more than 300 square miles, mostly in Northern California since Thursday, according to Cal Fire. Firefighters have only been able to contained about one-quarter of raging infernos. The Camp Fire, the largest of the three, burned 111,000 acres, and is only 25 percent contained. The fire spread quickly due to bone-dry conditions and fast-moving Santa Ana winds. What’s become the most destructive wildfire in state history essentially “wiped out” the northern California town of Paradise, displacing more than 26,000 people. The fire also burned up more than 6,800 homes and business buildings. 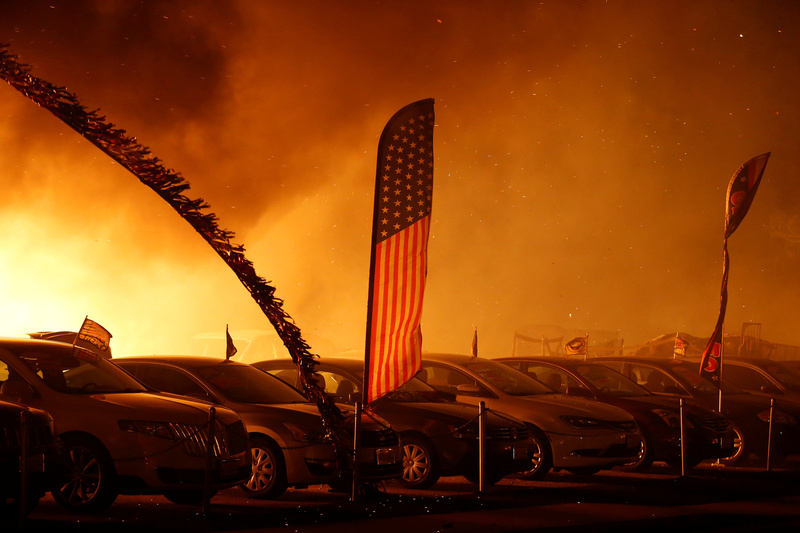 An American flag is seen at an engulfed car dealership during the Camp Fire in Paradise, California, U.S. November 8, 2018. REUTERS/Stephen Lam. Officials say at least 29 people died in the Camp Fire in or around Paradise. However, another 228 are still unaccounted for as of Monday morning, CNN reported. Down south, the Woolsey fire, also aided by strong Santa Ana winds, spread over 85,000 acres from Ventura County into Malibu, destroying hundreds of homes and forcing thousands to evacuate. Firefighters made some progress containing the Woolsey Fire, CBS News reported. Residents have been allowed to return to parts of Agoura Hills and Westlake Village. The fire has so far claimed two lives. More than 300,000 Californians were forced to evacuate, including 160,000 from the Los Angeles-area where the Woosley Fire and smaller Hill Fire burned. The Hill Fire consumed under 5,000 acres and is mostly contained, Cal Fire said. Santa Ana winds are expected to continue through Tuesday, meaning smoke from the fires will be pushed out to sea, but fire risks remain because of the low humidity and wind gusts. Up north, air quality will continue to be poor, according to the National Weather Service, and low temperatures are forecast for Monday morning.